Earlier I had shared the 8 things to follow while implementing blended learning via an LMS. For some of you the question might still be – why should my, or any organization for that matter, implement blended learning via an LMS? What advantages would it bring to my current training outputs? I am sure that nothing but a few foreseeable merits of leveraging an LMS for blended learning will encourage and motivate you to think about implementing it in your organization. Learning about these advantages will also help you in setting your expectations from it correctly and devising a plan based on these expectations. So here are the 10 advantages of leveraging an LMS for blended learning, justifiably segregated for administrators and learners – both who will be a part of your blended learning program. Using an LMS to manage blended learning will improve and streamline your training administration process, allowing you to plan your training activities calendar and share it with your learners, trainers and co-administrators. With this, you can schedule and run your offline and online training as per the schedule, administer assessments pre or post your training programs and generate instant reports to determine the success of your overall training. An LMS also allows you to easily track the progress of your learners individually on a day-today basis (or as required), which is a time consuming and resource exhaustive task when done manually. Overall, it centralizes your training function and reduces your time and cost expenditures. It is a well known fact that different people learn in different ways, with most being able to retain only 10% of what they hear. However, the learning and retention gets incrementally better with the addition of a new sense. This means, a training program that offers a variety of approaches, including face-to-face, online, mobile to name a few, is bound to have a greater success rate. And blended learning program carried out via an LMS enables you to do just that. Choosing the right blend will help you break the monotony of a classroom session and the impersonal-ness of online learning. By pulling in formal and informal learning channels together, you can increase communication and collaborative learning not just amongst your learners but also between learners and trainers. With an LMS’ robust and scalable architecture, training is not limited to the seating capacity of your classroom. You can reach out to a large number of learners, irrespective of their location and department. Your classroom training programs with limited reach can be substituted, wherever possible, with eLearning courses and virtual learning sessions that can be delivered to wide audiences spread across different geographies, without affecting the consistency and quality of your training. The LMS’ secure system and robust server, facilitates uploading, storing and sharing of learning resources in the form of courses, assessments, documents and manuals that complement your blended learning program. These online resources serve as a repository for your learners to access information just-in-time of need or as performance-support tools during a face-to-face learning session. With digitization of the work processes and workplaces, today almost every employee is equipped with a desktop or laptop (even both, sometimes) and a mobile phone (of course!) at work. This entails a ready opportunity to leverage the existing technology at hand for learning without spending surplus budget on setting the basic infrastructure. By leveraging an LMS to deliver blended learning, you can not only make your training future-ready (brought in by Mobile and Social Learning), but the use of everyday devices as a means of training delivery will make learning an easy and interesting process for your learners. With LMS being used as the central platform for managing blended learning across your multi-department, geographically dispersed organization, training will no longer be dominated and hindered by time restrictions and will become a continuous process, available as and when needed by the learner. Apart from attending face-to-face training session or participating in a live group discussion, learners can continue acquiring and exchanging additional knowledge over the LMS through social learning and knowledge collaboration features like chat rooms, forums, online access to experts/ trainers, wikis, blog, etc. While classroom is limited to words spoken and written by instructors, and is trapped in hard copies of the materials distributed for reference, blended learning via an LMS goes far and beyond. It offers learner-centric online as well as offline learning channels to cater to different learning needs and demands. Your learners can access a variety of learning elements in different media formats, like HTML courses, videos, podcasts, text files and lot more, stored on an LMS. This serves as a knowledge repository for a large amount of information which when accessed can provide an effective and engaging learning experience for your learners, which is not usually possible in simple, white board training approaches. Missing face-to-face learning session for some (usually unavoidable) reason will not mean loss of crucial information for your learners while using an LMS for managing blended learning programs. They can access learning resources and even recording of the session (if provided) later via an LMS. Thus, learners are not completely dependent on one source of information, but can access it from the LMS whenever they need it. This also encourages self-paced learning amongst the learners and increases knowledge retention as it is acquired at their own level of comfort. While face-to-face training brings in a personal touch to the training process, online training channels increase approachability. As I mentioned earlier, collaborative and social learning tools, and online help provided by trainers/experts/instructors facilitate interaction between learners and trainers. Learners can get their queries answered in real-time from their instructors and can even lend a helping hand to their peers in sociable way. The benefits of both learning methodologies – traditional and contemporary- are pronounced and transferred to the learners when delivering blended learning via an LMS. While the learners can benefit from the personal interaction brought in by classroom and virtual training, the collaborative environment provided by knowledge collaboration and social learning tools ensures that knowledge is no longer contained in silos defined by geography, function or domain, and can be shared and viewed transparently. Do you foresee any other advantages of leveraging an LMS for blended learning? Do share in the comment box below. 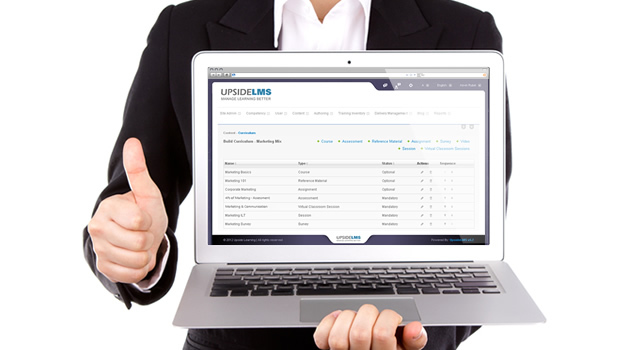 Also, if you would like to see how our Learning Management System, UpsideLMS, enables blended learning, request a personalized live demo now.